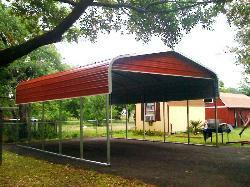 Waldrop Manufacturing offers many options and accessories for your metal buildings or carports. If you want to add that custom touch, or if you simply need replacement parts, we can help you. Below are some of the metal buildings and steel carports options and accessories that are available for purchase - either separately or to be included with the purchase of your metal structure. Pricing: The pricing will tend to fluctuate as do the cost of raw materials. If you have any questions, or if you would like a no-pressure price, please contact us. Used to put along the ground or concrete pad to level and adjust the building. Waldrop Mfg. uses 2' standard cup height, which is 1'6" higher than other building manufacturers. This provides a squared corner look without sacrificing the strength of the Waldrop Bend. gable ends of horizontally sheeted buildings. This is standard for covering the corners of full buildings. This is the sheeted portion of the peak. Pictured here, the gable end is the red sheeted panel that is over top of the carport entrance.